A person tag (AKA people tag) is a person mention that is also a tag on a post that refers to a specific person by URL rather than just a word or phrase, and is done as an explicit tagging action by the user, beyond just mentioning a person via hyperlink / h-card / or @-name, autocompleted or not. By supporting people tags in posts, you can more explicitly/automatically notify people via webmention to their homepage at their URL that you have explicitly tagged a post as being about them, e.g. a photo post where they're in the photo. That will tag the current h-entry as being about Ryan Barrett of snarfed.org and Tantek Çelik of tantek.com. If the current h-entry has a "u-tag-of" link to another post, then it is a tag-reply that tags that other post as being about those people. Providing silo profile URLs for the silos you want to POSSE to, e.g. using a service like Bridgy. TIP: You should only provide links to a person's (multiple) other profiles that they themselves link to from their personal site (or possibly if their known public other profile (e.g. Twitter) links to their personal site) or if their site and other profiles are linked from a reputable public source like Wikipedia. E.g. if a person does not link from their personal site to their Facebook profile, you should not link to them as if they are the same person. If you receive a webmention to your homepage, how do you know, that the intent was to tell you that you were tagged in a post? You parse the "u-category" on the link to your site to see that that link is "tag" of the containing h-entry. That is, when you verify the webmention, if you see that the link to you is on a u-category inside an h-entry, that means you have been person-tagged in that h-entry. More recent examples have hovercards support added for example indiewebcamp sf 2015 - this is done dynamically using a js script calling unmung's hovercard endpoint. Thanks to webmention.herokuapp.com person tags to kevinmarks.com show up on his homepage as comments. bridgy echoing back twitter @ mentions make up most of these. Ben Roberts has person-tags on his site using Postly since 2015-04-30. This is done through any micropub endpoint simply entering a URL as a category. The micropub endpoint fetches the URL to check for an h-card and, if available, will tag with the name and url extracted from that h-card. Support for receiving tags and being tagged added on 2015-05-03.
subsequently Ben used his person-tagging support in MobilePub to be player A in passing SWAT0 at IndieWebCamp 2015. Ryan Barrett adds person-tag markup manually to some of his WordPress posts since 2015-11-18, e.g. 2015-11-18 photo: Celebrating Homebrew Website Club’s 2nd anniversary. as such used his manual person-tagging to be player A, one of two indieweb players, in passing Silo SWAT0 at Homebrew Website Club SF 2015-11-18! Bryn Wölfka posts short notes with person-tags on her WordPress blog since 2015-12-03, e.g. Using two person-tags each with multiple other profiles. FB POSSE copy including 3 person-tags from the original post, automatically via Bridgy Publish. blogroll entries have a json object stored in wordpress's "notes" field for the record. Kevin Marks uses Noterlive on www.kevinmarks.com to publish collections of live tweets. The micropub client MobilePub has an interface for supporting person-tags on a post. OwnYourGram translates person-tags on Instagram (of their @-names) into person-tags of people's personal sites (assuming they link them on their IG profiles), when posting to your site via micropub. Bridgy Publish consumes (parses) person-tags from your original post, and cross-posts them in POSSE copies to at least Facebook and Flickr. #459 - support person-tags (including to Twitter). Closed because no sign of API support now or soon. #547 - support "fake" person-tags as in-tweet text. Unlikely as a lot of custom work, and should be prototyped with Indie Web (perhaps manual) POSSEing first. Tantek Çelik I am interested in helping solve this problem to escape the "50 person-tags limit" in Facebook photos (as documented below in #Silo_Examples). A group I am involved with posts group photos every week with more than 50 people and people get left out because of this limitation. I don't want people to be left out. ĎÚβĨŐÚŚ Dod Personally, I find tagging to be a dangerous habbit (especially today, when face recognition is becoming more and more available to governments and more common criminals). I may be old fashioned, but I believe that any person-tagging protocol should involve consent or "moderation" by the person being tagged. The protocol should require some way of privately informing the tag's target that there's a photo (perhaps of something that "happened in Vegas") and the target should confirm to the source (e.g. via clicking a link and posting a form with the picture and a "This is me and you can publish that this is me" checkbox). If it didn't happen (or if there's no way to reach the target), it should be considered bad manners to publish such a tag. At least IMHO. Amy Guy I agree that telling the world 'this person is here', eg. in a photo, checkin, article about someone should certainly have some kind of consent - the tagged person is alerted and can say yes or no to the tag being published with the post. Maybe just by rejecting a webmention. The following silos support people tagging and are thus a good starting point for documenting people-tagging user experiences for recreation on indieweb sites. Facebook - all post types, an explicit text mention is interpreted as a people tag, plus you can explicitly people tag areas of photo posts. Limitation: you can only tag up to 50 people in a photo on Facebook. Flickr - you can people tag a photo and optionally denote a rectangle of the photo that indicates that person. Instagram - you can people tag a photo and optionally denote a point on the photo (from which the label of the person's name is hung). Twitter - photos in tweets can be people-tagged - see details. Google+ - photos can be people-tagged - see details. Lack of Oxford comma makes the latter two people errantly appear to be siblings, since second only has a given name, and third has both given and surnames. This is a good concrete example of why an algorithmic situation (such as a list of three people) should always automatically use an Oxford comma. There is currently (2015-11-05) no API support for posting person tags on photos to Twitter. When writing a description/shout on a Swarm checkin, if you start typing the name of a person, the Foursquare app Swarm will pop-up a UI to pick from friend's names matching what you've typed, which you can pick, or dismiss and keep typing text. 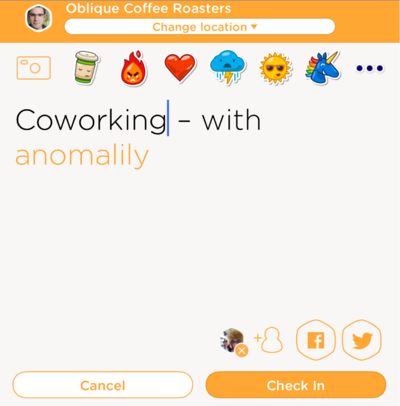 If you pick someone from that person-choose UI, Swarm adds a person-mention with orange background inline in your comment, AND adds a person tag in a little mini-face-pile at the bottom just above the (Cancel) (Checkin) buttons. The person-mentions are uneditable but each deletable as a whole name. If you delete a person-mention inline in the content, the respective person-tag icon below is also removed. Each person-tag icon has a little orange circle with white x on its lower right quadrant, and clicking that will remove the person-tag (but leave the person-mention intact). After the checkin is created, the person-mention still appears inline with the checkin note. '#' - is now known as the method by which to explicitly tag something (hashtag) with a term, above and beyond merely mentioning that term. it makes sense to try re-using the '#' prefix to mean "explicitly tag with this"
Thus: #tantek.com as plain text shorthand to mean explicitly (person)-tag with "tantek.com"
Until we can depend on publishing and consuming systems having rel-me caches (lazily grown) in general, publishers may want to explicitly publish multiple URLs per person. The u-category + h-card markup allows for this already, yet it would be nice to also have a plain text authoring solution that has a reasonably legible / re-editable fallback. Or fb/ or f/ possibly? Q: How can consuming code tell the difference between a person and an org from such a hand-authored "person-tag"? Does it matter? Facebook: if there's content="fb://page/ per the above notes, that presence of "page" means it's an org, not a person (which would have "profile" there instead"). Twitter: if the Twitter profile has a URL, then apply "own domain" test above. In each of these cases, a nicknamescache could be used to auto-expand the parenthetical portion (of additional identities for person-tag (semi-)supporting silo destinations), as well as change a Twitter person-tag into one that is indieweb-primary with their Twitter profile inside the parentheses. A separate UI for authoring person-tags, at a minimum a field, perhaps re-use an existing separate "tags" field, where you can author plain text person-tags just as the above. In this case this plain text set of tags could be stored directly in a separate property of the h-entry, like say p-x-user-tags, which was then used to automatically generate person-tag markup when presented on the web. Given the increased complexity of implementing proper tweet text for inline content person-tags (option 1 above), it makes sense to first try implementing a separate UI first (as a text input field), since that should be simpler (less code to build a reasonably usable feature). UI: input field that maps 1:1 into content storage, e.g. storage: perhaps a "p-x-user-tags" property inside the "h-entry", a space separated set of plain-text person-tags, no need for # prefix. else create plain p-category tag for it. While you're typing, the code should check what you type with your nicknames-cache, and suggest matching names. Person-tag presentation should be outside e-content but before before web actions buttons. Since person-tags have a specific semantic above and beyond the plain text content of a post, and frankly there's no "#" equivalent for explicit-person tags (@-mention already means, mention, not tag), it makes sense to design a way of presenting person-tags that is distinct from the plain text content, and (likely) different from what is easiest to type! Each of these brainstorms/examples is expected to be put on its own line, with a line-break before and/or after as needed if there is anything before or after respectively. On systems which auto-link the text, it's slightly nicer to provide the people's domain names as well. Which is still another option if someone wishes to experiment with it. Alternatively if Person2 does not have a domain then simply use their given name. If there are more than three person-tags, I think it is best to use a "summary" approach like seen in summaries of person-tag lists on Facebook etc. For such summaries on Twitter it makes sense to give @-names preferential treatment over indieweb domains over people lacking both. The phrase "and others" feels a bit awkward though without the number, perhaps due to seeing it too often with a number. Alternatively we could use the word "more" an ellpsis "…" or both "more …"
This keeps it nice and short and devoid of noisy punctuation when possible (all good things on Twitter's tweet-length limited medium). Where "author.example.com/original-post" is what is displayed in the text, yet it is fully hyperlinked to the original, that is, Twitter's normal behavior for hyperlinks in the plain text content. If an author can enter person-tags (e.g. per above "#" proposal) inline in content, there are additional considerations for the tweet text. with more than one in a row, omit intervening 👤 as it's obvious from context. Note that none of these examples include a separate line (near the bottom) starting with "👤" because all the person-tags are indicated inline (since they were authored that way). Summary: HTML area tags could be used to area-person-tag people in photos, and could be parsed via mf2, however they lack a good/obvious mapping to micropub, which makes this approach problematic. Archived here for documentation purposes. However, because the HTML syntax of imagemaps sits outside the actual image tag, it may be worth adding a microformat to the map itself. 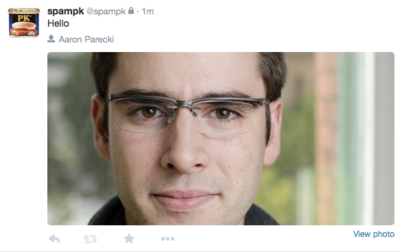 Q: Should twitter handle links be person tags? A: No. Tagging a person is different from mentioning them. Twitter @-mentions are not person-tags by default; absent any other information they are merely @-mentions, mentions as it were, not tags. People tagging was one of the steps of the SWAT0 social web acid test developed / proposed in 2010. This page was last edited on 19 April 2019, at 19:25.